The campaign also sent a letter to the CEO’s of the four largest Dollar store chains — including Family Dollar (tentatively acquired by Dollar Tree on January 22), Dollar Tree, Dollar General, and 99 Cents Only urging them to stop the sale of products with hazardous chemicals to communities of color and low-income families, who already live in more polluted areas and “food deserts,” and adopt policies that will protect both customers and their businesses. Combined these discount chains have sales totaling over $36 billion and operate more stores nationally than Walmart. In addition, 40% of sales at Dollar stores go toward food products (not tested for this report) — much of which is highly processed with low nutritional quality, and whose packaging is another potential source of toxic chemicals including bisphenol-A (BPA), a synthetic hormone linked to breast and others cancers, reproductive problems, obesity, early puberty and heart disease. Fortunately, there is a growing movement by mainstream retail and manufacturing brands — including Target and Walmart — to respond to consumer demand for safer products with publicly-available corporate policies that identify, disclose, and replace priority toxic chemicals with safer alternatives. 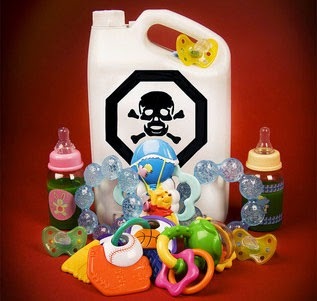 By failing to address toxic chemicals through comprehensive policies, Dollar chains are not only putting their customers at risk, they are exposing their businesses to the fate of companies like Mattel, which lost 18% of its value after recalling toys with lead paint, and Sigg USA, which went bankrupt after failing to disclose toxic BPA in its water bottles. Local, State, and Federal Governments ensure that discount retailers comply with all relevant laws and regulations; and adopt public policies (such as Maine’s Kid-Safe Products Law and WashingtReon’s Children’s Safe Products Act) that require manufacturers and retailers to disclose hazardous chemicals in products, research alternatives, and remove hazardous chemicals when alternatives are available, effective, and safer.